Australian painter Larry Mitchell has been traveling to the South Pacific Islands since the late 1970s, and for more than twenty years sailing to and painting the effects of globalization and climate change on the islands in the Indian Ocean, in particular the Abrolhos group off Western Australia. He has taken these concerns across the Southern Hemisphere to as far away as the Antarctic. 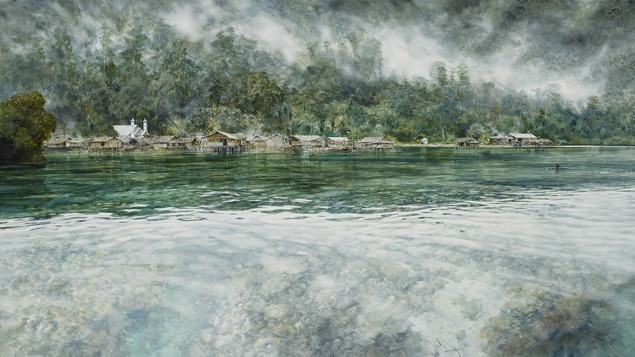 His works, often panoramic paintings based on detailed topographical sketches and photographs, use the techniques of visual representation deployed by voyages of exploration during earlier centuries, but ironically now in the cause of documenting the changes wrought as a result of that very colonialization. More than twenty years ago Mitchell noticed that life in the small islands and fishing villages in the Southern Hemisphere was changing. Tropical storms were becoming more frequent and devastating, palm trees were dying off, the fishing stocks were depleted, and reef life less robust. After the turn of the last century it was apparent that industrial-scale trawler fishing was making it impossible for local fishermen to be economically competitive, and that the warming of the oceans was causing the storms to increase and ocean levels to rise. The islands of the Indian Ocean and the South Pacific, and the coastal villages of Papua New Guinea were drowning. To add insult to injury, ill-advised and illegal logging was also taking a toll. Mitchell, who had started out painting places that he loved, re-conceived this part of his artistic practice into what he now calls the 1ºC Project, which refers to the one-degree centigrade increase in ocean temperatures that is causing so many of the changes he is witnessing. His travels in the waters of the Southern Hemisphere have now taken him around the tip of Patagonia, through Tierra del Fuego, and down into the sub-Antarctic islands. This exhibition is drawn from the extensive archives of the project that Mitchell has donated to the Center for Art + Environment at the Nevada Museum of Art. Larry Mitchell was born 1953 in Northhampton, just north of Geraldton, Western Australia. Spending as much of his childhood as possible near or in the ocean, he travelled to London in the 1980s, and studied the work of everyone from the abstract expressionists through Lucien Freud with the ambition to be an abstract painter. Upon his return to Australia he worked at more than fifty jobs to support himself before landing a teaching job at St. Patricks College in Geraldton (1976-1987). After working as a lecturer at various TAFE colleges in the Perth district (1989-1992), he became a full-time painter.